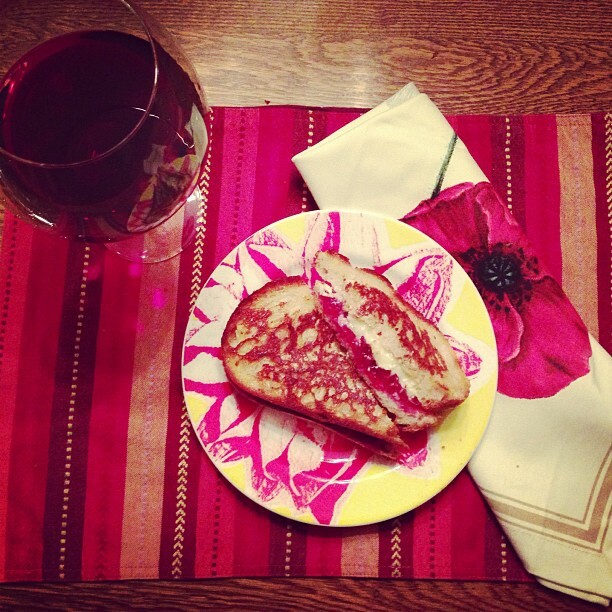 Ooey Gooey Cranberry Brie Grilled Cheese Goodness! Wow, I cannot believe it’s been over a month since my last post. I’ve been silent. I’ve been reflective. I’ve been recharging my battery. When I do such I spiral in and center. It’s been especially necessary for centering lately with life tying some loose ends, family illness, holidays that just keep cropping up despite the fact they come every year, with the final surprising blow being a car accident that I was in a few weeks ago. My neck is out of alignment as well as the back of my car pretty much toast; I was rear ended full force with the fleeting thought of “this is it, this is how my life will end” only to be filled with gratitude to walk away with minor injuries. I counted my blessings for strong bumpers, seat belts and the fact my little girl was not in the car. I vowed I would not let things get away from me again, so here I am. I was fortunate to have my family here for my foray into the poultry fest. The last time I cooked a turkey I was pregnant, she’s now 4 and a 1/2 years of age, so I was a bit worried that my trussing and stuffing skills would be a bit rusty. All went well, other than my usual cooking tendency to cook too much; rather than food for 8, I had enough food for a small army. I have so many leftovers spilling out of tupperware in my fridge that I’m wondering how I can get through them with imagination and the path of least resistance from my tummy. I love turkey, potatoes-both country mashed and sweet potato puree-and great grandma’s stuffing, but certainly not for every meal during the week. Fortunately, I didn’t have to go farther than my email inbox for post turkey feast inspiration to strike. I follow Joy the Baker, an amazing cooking/baking blog that I stumbled upon last spring after googling for a recipe to make pumpkin bread. I was excited to see her fancy version of grilled cheese, aptly coined Cranberry and Brie Grilled Cheese, shining like a bright crimson star on Black Friday. It starts out like a fairy tale: the tart red cranberry sauce meets the cool creamy brie who then spice things up with whole grain mustard finally to join in melted matrimony between two slices of sourdough crusty bread toasted to perfection; it’s not hard to see how this happily ever after goes. Nothing speaks to my food soul as comfort food infused-with-a-twist style of cooking. I won’t list step-by-step instructions, or the recipe, but if you’re wanting instructions for this rendition of grilled cheese-and I promise I won’t judge you- click the link and check her mad photography skills clearly matched with her cooking chops. I even took a pic of mine and posted for all my peeps to drool over see on Facebook, Instagram and now I’m blogging about it for all of you in the blogosphere. Yes, it’s that good and you can totally thank me later for sharing the love. I paired with a glass of Cupcake Red Velvet wine and settled into Grace Potter and The Nocturnals’ latest release “The Lion The Beast and The Beat” pulsing from the speakers; a divine end to a crazy hectic month. I recently discovered Grace Potter & The Nocturnals and believe her vocals help channel my inner vixen, the part of me that recharges on Cranberry Brie Grilled Cheese, rocking vibes and motorcycle boots-oops thats a whole other blog post though. I’m going to share my cranberry sauce recipe, as it uses no sugar. Seriously! Mix cranberries, juice, honey in a pot. Cook on low heat for about 5 minute, until cranberries burst. Stir in orange zest, let cool to room temperature before serving (or cool in fridge). That sounds YUMMY… I’ll have to try it in the near future! Thanks for sharing! This whole post has such a cozy feel to it – the wine, the music, the warm and comforting food… self-care at it’s finest! I would love to dry this sandwich with goat cheese. :) Can’t wait to read more, Kristy!